Maia put a picture of her grandmother on her blog a while back. I found one of mine, and thought it was appropriate to put it on here for Mother's Day. 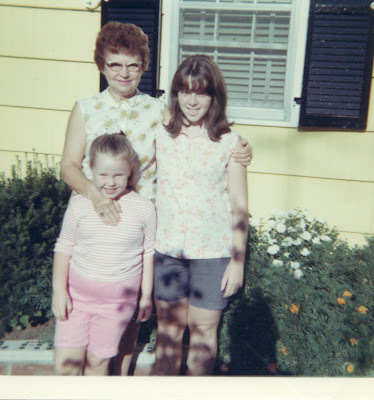 My grandma had a huge roll in raising me, and I loved her dearly. I miss her every day, even though she's been gone for over 30 years. When the going gets tough, I feel her presence so strongly, like she's right by my side helping me. I didn't think I'd go this direction with my knitting blog - wanted to keep it all knitting, etc., but I thought grandma should be immortalized here. She would have loved the internet. She was forever clipping patterns for knitting and crochet from Family Circle and Good Housekeeping. I saved many of them. It's so great to have her handwriting on them. It makes me feel like she's still here. In her later years, she was enamored with crewel work, and we are fortunate to have some beautiful pieces - part of her legacy. We did all kinds of crafts together. We loved to paint ceramics together, and make Christmas ornaments with satin balls, sequins, bead and pins. Some of our ornaments were like snow globes, with little scenes inside, like a snowman or a creche. We would make a mess, and there was one night when Grandpa found sparkles in his meatloaf! BTW, that's my sister next to me, (the taller one, but now I'm taller) She was the Fetching recipient. Seems there were no pictures of me and Grandma alone that I could find, even though we spent more time alone together than either of my sisters did. So Alyce, you gave me the love of creating beautiful things. I love you. Happy Mother's Day. Ah, a relaxing day at the beach! 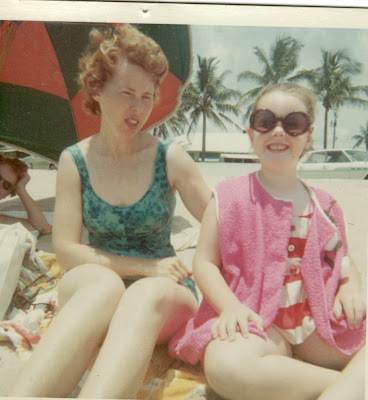 Mom and I (and the rest of the family) were visitng my Grandparents and vacationing in Florida. The picture probably preceded a lunch of hard boiled eggs and sandwiches. As you can see, I had an innate sense of fashion even at an early age... Claire, no one could love a mom more than I love you. Happy Mother's Day.